I often hear of writers who don’t believe they’re actually writers. 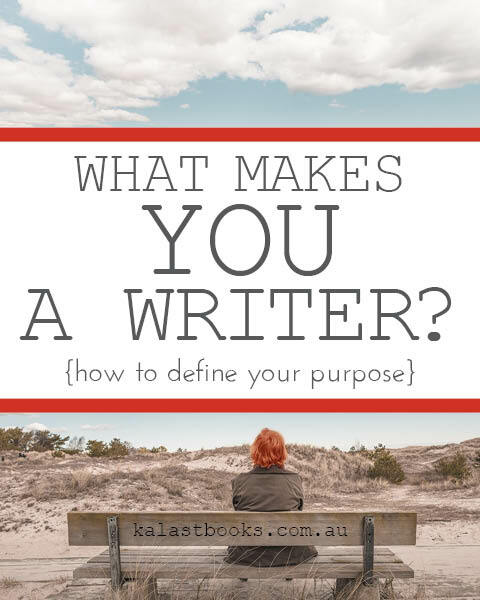 If you spend time creating stories with words, in any form whether it be a diary entry, blog post, novel, poem, play, the list is endless … then you are a writer. Say it with me. I am a writer. You don’t have to be published or famous, to achieve writer status. All you have to do is write. Today I thought I’d share with you the top ten things being a writer means to me. 1) Happiness: When I’m writing, I’m happy. When I’m thinking about writing, I’m happy. 2) Creativity: I’m a highly visual person, and I love to create. Whether it’s painting, colouring, illustrating, designing, or writing, I love seeing my creations come to life. Writing is just one of the many forms of creativity I enjoy. 3) An escape: When I write, I’m taken away from the real world and into a place that I love to be. I have no worries in my imaginary worlds, and my characters wrap me up in a warm blanket and keep me safe. 4) Time out: I see writing as a way to take time out from everyday life. This could be considered the same thing as escaping, but I disagree. Sometimes I don’t need to forget about the real world. Sometimes all I need is a short break from it. 5) Stress relief: This is a big one for me. I get anxious over the smallest things, and it can be quite debilitating. Writing helps me calm down and deal with issues in a better way. I find the act of writing very therapeutic. 6) A Challenge: I like to set goals and reach above and beyond them, but this is challenging on the days when I’m time poor. I also like to improve and better myself and my skill. Writing every day helps me achieve this. Writing also challenges me to think about certain things differently, and I like having to look at situations from several angles. 7) An opportunity: I see my writing as an opportunity to connect with lots of different people in many different ways. This connection can be through interacting with fans of my work, or through meeting like-minded people in the form of other writers. 8) A sense of accomplishment: When someone tells me they’ve read my book and loved it, it gives me all the fuzzy feels. There is no better feeling than knowing I have touched someone with my writing. I also feel accomplished when I meet my personal goals and striving for them keeps me going. 9) A way to entertain: Story telling is a great form of entertainment. I enjoy reading, and if I can write something that someone else enjoys reading, then even better. There’s nothing more satisfying than the feeling you get when someone tells you how much they enjoyed reading your story. 10) A purpose: I feel that my writing gives me purpose. It’s one of (the many) reasons why I get up every day. It gives me something to look forward to, and helps me face things I don’t always want to. I enjoy spending time with my characters and their world, and bringing them to life. It’s like they’re my children, and it’s my job to care for them and nurture them into existence. So the next time you tell yourself, or someone else tells you you’re not a writer, because you don’t have anything published, or no one knows about your work, or *insert other reasons here*, don’t listen to them. Be the writer you want to be. Download my free worksheet and fill it out to remind yourself why you love to write.